Today’s article shows you how to build a basic wireless input and output system in the form of a single transmitter and single receiver. Communication is one way to keep things simple with two xbee modules being used for the wireless link. In the end, a small trimpot will control the movement of a servo motor. 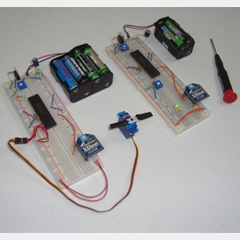 how many servo motors can b operate wirelessly using this xbee wireless module? i wanna operate 5 servo motors.